This weekend protests were held in several cities across China. 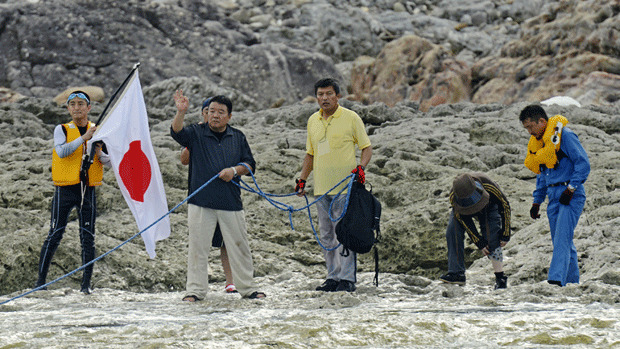 In each the focus of the anger was Japan, due to their arrest of Chinese protesters trying to plant flags on disputed islands in the East China Sea (See my earlier post: “You Say Senkaku, I say Diaoyu” – Hong Kong Enters Islands Dispute in China Sea). As thousands protested across China, activists from Japan raised their flags on the same disputed land. Get ready for more trouble. The weekend demonstrations occurred in several cities including Guangzhou, Jinan, Hangzhou, Chengdu, Changsha, Wenzhou, Harbin and Shenzhen. There was a gathering also in Hong Kong. Due to the security clamp-down in advance of the National People’s Committee of the Communist Party of China, Beijing was not the scene of any demonstration. What’s important to note is that in each city police and city officials played a part in the protests. One organiser worked with city officials to plan the route and ensure it was an orderly march. In no city did police interrupt protests, except in Shenzhen where stores were looted and Japanese cars were overturned (including a police car). Targeted in the actions were Japanese-owned and Japanese-looking shops. Sushi restaurants owned and operated by Mainland restauranteurs didn’t escape the attacks. Windows were smashed and interiors destroyed. The protests destroyed the livelihood of numerous businesses. Those attending feel hotter than before and more stoked against Japan. Meanwhile their citizens are acting out to claim sovereignty of these small islands. Where will it lead? On Hainan Island military analysts confirm that China has built military hospitals capable of taking war wounded. It’s 1936 once more. ← When will ‘Made in China’ be as good as ‘Made in Japan’?